Wanna be more in tune with your inner spirit or inner self? Wanna add a bit of mystery and magic to your day or to your environment? No problem, because purple is the perfect color for this purpose. Purple comes laced with it's very own mystical and spiritual energy. In my opinion this is the color to wear when you want to be in the world, but not of it. Maybe you want to go out and handle your business without much resistance or interference from others. Purple will exalt your spirit and keep you above everyday riff raft. It helps one to sort of float through the day. Try it out! Wanna be sure you make sound decisions today? Wear something purple or place this color around you. It will assist you in making good judgments about people, projects or particular circumstances. This is one reason that the color purple is associated with royalty or those in high power. It provides a clear mind and spirit and helps the individual make great decisions that can benefit others in a grand way. Purple is the color of purpose, adorn yourself with it when you want others to take your words and ideas seriously. Purple says that you mean business, but not in an aggressive way such as with the color red, but in a balanced and graceful way. Purple is my favorite color because it lends a natural gracefulness to its wearer in most cases, you only need be aware of it. 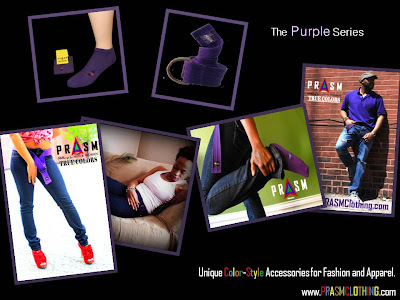 Check out the hot collection of PRASM's color-style accessories in our online store for a perfect way to add color energy to your everyday attire! We carry purple accessories that can assist you on your journey to become more self empowered. Check us out!